Jimmy Brock was a crowd favorite at midget races in the Detroit area in the 1930's and early 1940's. He was said at the time that he was "absolutely without fear and drives with reckless abandon as fast as the little car will go." Although he did not often win, Jimmy was a real competitor. Read on for more from the time about this fascinating guy. Jimmy Brock was not a great midget champion. He won a race occasionally, but not often. Rather he was one of those indispensible drivers that makes champions possible. 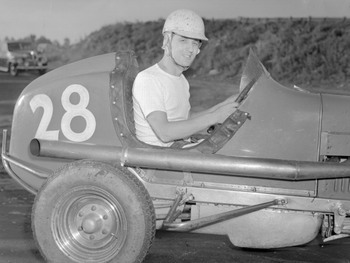 Jimmy was one of those guys who showed up to race every night of the week whether it was at Detroit's Motor City Speedway or at tracks in the Michigan/Ohio area like the Flint Speedway, Bigelow Field in Grand Rapids or Ft. Miami Speedway near Toledo. 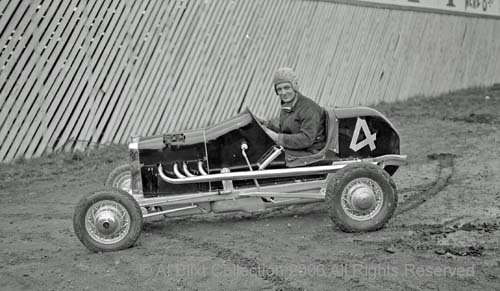 He raced full time in the 1930's against drivers like Duke Nalon, Eddie Ostwick, Carl Foreberg, Sam Hanks, Art Hartsfeld and Ralph Pratt. 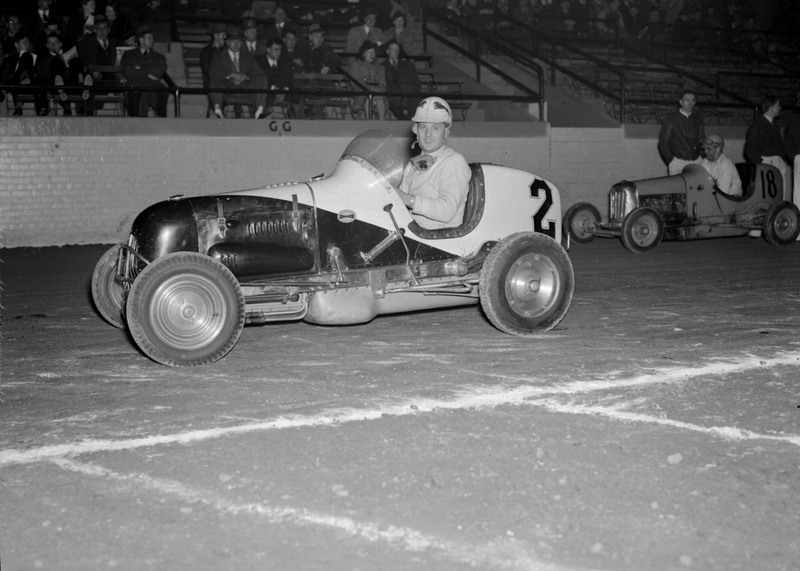 That meant racing midgets indoors in the winter months at the Detroit Fairgrounds Coliseum or the the University of Detroit arena. On a good night, he might finish third. On a bad night, he might not qualify. Yet he was a crowd favorite because he was a fierce competitor. "Jimmy Brock, undoubtedly on of the toughest pilots in the business today, was born in Detroit in 1908 and grew up there on Detroit's east side. When Jimmy was fifteen year old he was hanging around the speedway garages getting the inside dope on what made the big jobs tick. At sixteen he was wheeling one of them after having convinced an owner that he was at least nineteen. And not doing too badly either. At seventeen he had ambitiously constructed his own race car and set out to really win some purses. He campaigned the big cars from that time on with very good success until 1930. In that year he was drawn to the bricks of Indianapolis by the lure of the fast moving five hundred mile classic. In that year he rode with Paul Bost, one of the outstanding pilots of the day. 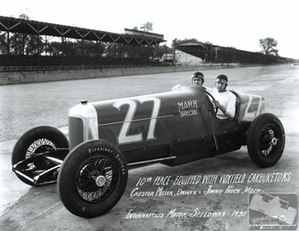 He rode again in 1931 and 1932 with Al Miller and Chet Miller and was Chet’s riding mechanic when he took that thrilling jump over the Indianapolis wall. 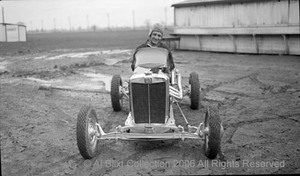 With the appearance of the midgets, Jimmy became one of the very first Detroit boys to get the feel of the very newest type of speedster. Jimmy was the first in Detroit, and possibly in the country, to adapt a V8-60 motor to the midget field. He appeared with the spanking new black V8 with the three chrome stacks on either side, and in his first appearance finished well up in the money. Shortly thereafter he copped a feature at the fast Motor City bowl. For the past six or seven years, Jimmy has devoted all his time to drving the ‘jeeps’ as he calls them. 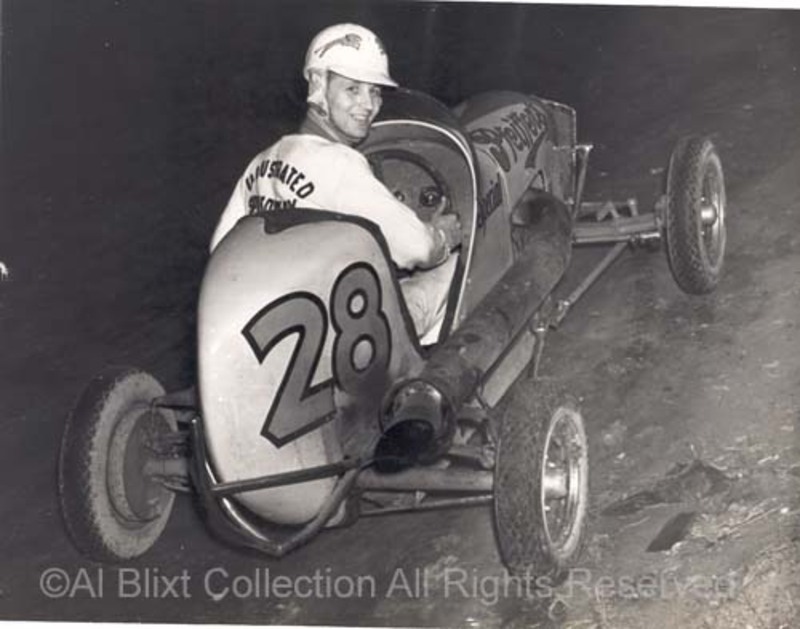 He has driven for many of the leading owners including Al Kamiinsky with his flying outboard, Angelo DiCicco, Detroit owner of the former (Ronney) Householder Offy; Lance Campbell with the fast No. 2 Offy, also a former Householder car. In addition to those named, he has driven the Al Placky outboard, the Bernard Jacobson outboard and several others. Jimmy is about 5 feet 8 inches tall and weighs about 160 pounds. He is dark, good looking and of quite a pleasant disposition. He is absolutely without fear and when on the track he drives with reckless abandon. Always puts on a good show and is well liked by the spectators. One of his most sensational spills was his tangle with Duke Nalon at the Motor City Speedway in 1940 which sent him hurtling over the high wall some forty feet in the air at a high rate of speed. Few expected to ever see him alive again as he disappeared from view. However, rescuers found him seating and swearing trying to get out of the half-buried racer. A quick trip to the crash house and he was O.K. again. Jimmy is married to charming Marge Brock who is always on the job rooting for her Jimmy. As a sideline from racing the two operate the Lucky Star Café near Motor City Speedway where the race crowd often congregate after the races." 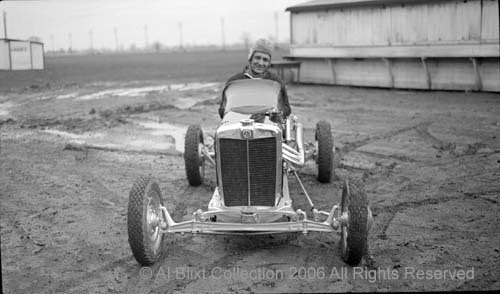 Brock was the riding mechanic for Chet Miller in 1930 and 1931. Here they are in the Marr Special in 1931. Many thanks to Kevin Triplett who has researched Jimmy's career and provided the link to this photo. For a complete Indy photo driver gallery go to the Indycar.com gallery. This is Jimmy in a Willys-powered midget at Detroit's Motor city Speedway in 1936. This might explain why he referred to his cars as "jeeps". Note football helmet. 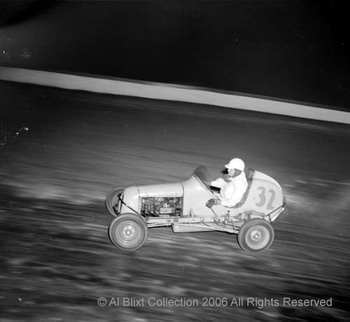 Here is Jimmy in action in #25 about 1938. Location unknown. Jimmy is pictured here in the DiCicco Offy, formerly owned by racing ledgend Ronnie Householder. This appears to be an indoor race, probably at the Michigan State Fair Coliseum. The photo was taken in 1939. 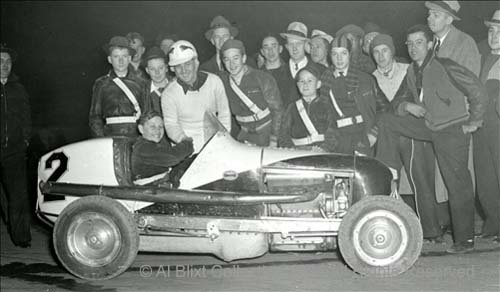 Brock poses with a group of saftey patrol boys after the races at Motor City in 1939. What a thrill for the boy sitting in his car and shaking hands with "a real race driver". 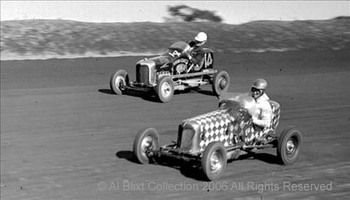 Brock duels with racing great Henry Banks in the famous Checkerboard offy on the Zeiter Motor Speedway one-half mile in 1937. Jimmy's brother George Brock also raced during the period although he was less successful. 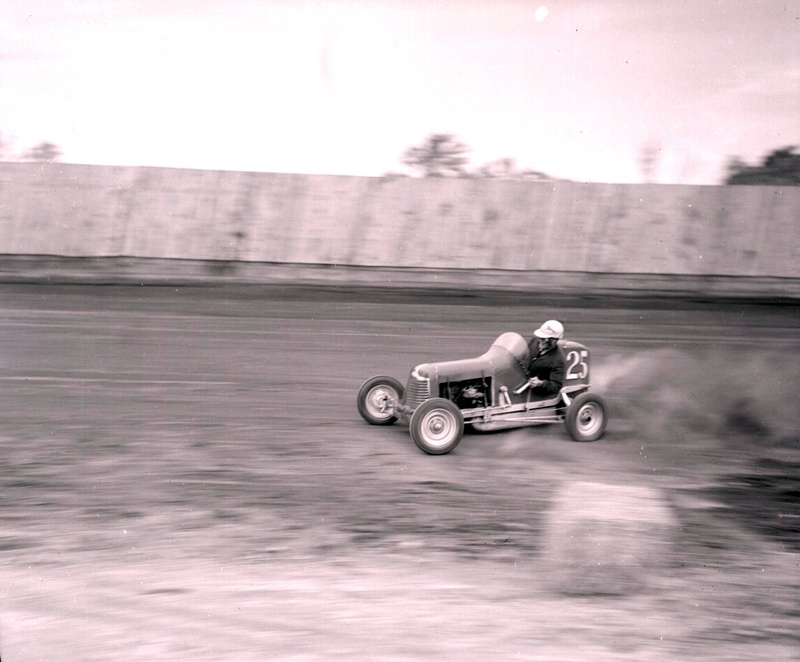 Here is George in action at the Motor City Speedway quarter-mile track in September 1940. Jimmy had his share of close calls. Here is the scene after his car rolled over at the Zeiter Motor Speedway in 1939. He was, as they said in those days, "okay" meaning not seriously injured. Here is Jimmy in the #28 Offy taken July 15, 1941. 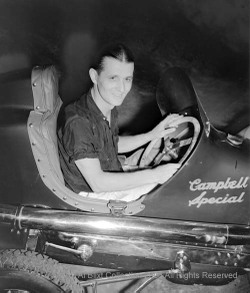 I have found no record that Jimmy drove after racing resumed following World War II. The reason is unknown. I found a notation on the back of one of my dad's photographs that he died in 1956. 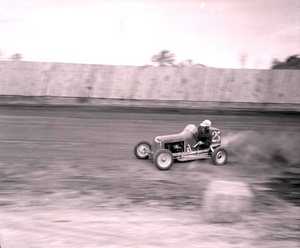 While he may not have won as many races as some, Jimmy had the heart of a champion and proved it by getting out there and pushing the "big boys" every night. Thanks to Jimmy and all of those who were like him. Jimmy died in the 60's. He was hospitalized following an accident. Appreciate the articles about Jimmy. My husband Tom, is his son & his namesake Jimmy is in racing also. Thanks for the info on him. My husband didn't have much to go on. This Jimmy Brock is my husbands grand dad. It's accually Jimmy Prock, most anything we have run across has the incorrect spelling. Great articale, we haven't run across many. If you have any more PLEASE forward them. Jimmys son, Thomas was just a youngster when his dad pass away so he doesn't really know to much about him. 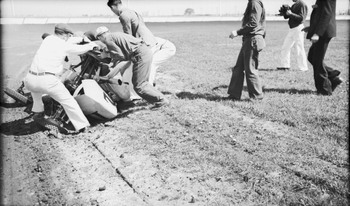 Great article and photos; a nice rememberance of Jimmy Brock one of the Indy riding mechanics who are often overlooked in the pages of history. A man would have to been brave to have taken the role of riding mechanic in those days. Before my time but great pictures and story. JIMMY is what auto racing was ment to be, DONT worry about the money. Just race and do your best!